Marine 31 Vinyl Cleaner & Conditioner is your one-step solution to keeping your boat's vinyl looking new. This is because Marine 31 Vinyl Cleaner & Conditioner is formulated with effective cleaning agents and powerful UV absorbers, both which work together to eliminate the common causes of vinyl aging. This product, like the rest of the Marine 31 range, was developed in south Florida by group of boat loving individuals who share a passion for protecting the environment. Marine 31 Vinyl Cleaner & Conditioner is eco-friendly and harbor-safe. A voyage on the sea coats your boat's plastic, rubber, and vinyl with body oil, fish remains, sea salt, dirt and grime. Marine 31 Vinyl Cleaner & Conditioner's gentle cleaners emulsify ground in dirt and grime, allowing the soil to be removed from the surface without drying it out. While keeping your vinyl surfaces clean certainty adds to the boating experience, it is only half of this amazing products ability. While Marine 31 Vinyl Cleaner & Conditioner is gently cleaning the surface, powerful Ciba Tinuvin UV Inhibitors are being absorbed into the surface. These are the most advanced and effective ultraviolet radiation absorbers available. They block the sun's rays from fading, drying out, or cracking your boat's vinyl, rubber and plastic. Marine 31 Vinyl Cleaner & Conditioner was designed without compromise. The cleaning agents remove dirt, grim and build up with the same vigor as commercial cleaners. This formula features a higher concentration UVA and UVB absorbers than pure protectants. 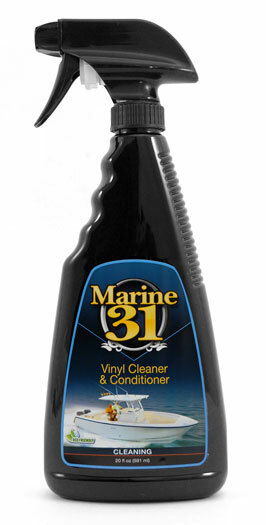 Marine 31 Vinyl Cleaner & Conditioner is easy-to-use, harbor-safe, and eco-friendly. A Tip From The Captain's Chair: Regular use of Vinyl Cleaner & Conditioner will add life to your watercraft's soft surfaces. This product should be part of your boat's regular care schedule. Take caution not to apply to any area where grip is a concern.